Indonesia destroyed 23 foreign vessels on Tuesday as part of its ongoing war on illegal fishing just two weeks after a confrontation with China on the issue. As I’ve written previously, Indonesia under President Joko “Jokowi” Widodo has launched a tough crackdown on illegal fishing in Indonesian waters, which he says causes the country to suffer annual losses of over $20 billion (See: “Explaining Indonesia’s ‘Sink the Vessels’ Policy Under Jokowi”). That has resulted in a series of highly public sinking of boats from neighboring countries through 2015 – part of what Jokowi has described as a “shock therapy” approach in spite of concerns among some of Indonesia’s neighbors. Though Indonesia finally did sink a Chinese vessel last year after much hesitation, managing tensions with Beijing continues to be an issue, as demonstrated in an incident on March 20 where a Chinese coast guard ship attempted to intercept an Indonesian crackdown on a Chinese boat for illegal fishing, sparking unprecedented rage from Jakarta (See: “Will Indonesia’s South China Sea Policy Change Amid China’s Assertiveness”). On Tuesday, the country’s maritime and fisheries minister Susi Pudjiastuti said her agency had sunk 10 Malaysian and 13 Vietnamese ships caught fishing illegally in Indonesian waters. The vessels were blown up at 10:45am Western Indonesia time in seven different locations across the country. 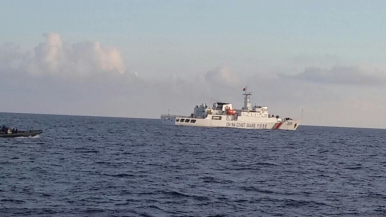 Though she denied claims that one of the vessels sunk was from China, she emphasized that vessels from all countries would be treated the same under Indonesia’s laws, going as far as to say that this would include one from the United States. “A U.S.-flagged boat will also be sunk if it were to be found fishing illegally in the country,” she said according to Antara news agency. Addressing the recent incident with China, she said that Indonesia was still awaiting a response from Beijing. “I am impressed and laud China’s law enforcement apparatus. I hope they would also respect Indonesia’s laws,” she said. Indonesia has sunk a total of 174 illegal fishing boats thus far, while 20 others could also be sunk following ongoing court rulings. As I reported previously, in February Indonesia had also destroyed the Nigeria-flagged Viking which was wanted internationally for illegally poaching toothfish (See: “Indonesia Blows Up Interpol Most Wanted Ship”). 317 vessels have now suffered this fate since President Jokowi has come to power.